I don’t know if I’ve ever told you, but I have this burning, never ending love for a household product. I absolutely adore Castile soap. I use it every single day in our home in everything from my homemade shave cream, my homemade dishwasher detergent, to my DIY Coconut Shampoo and more. I use it in cleaning products (that yes, I do plan on posting someday) and more. It is seriously my absolute favorite product hands down. It’s natural and it can be used for so many different uses that I just can’t walk away from it. 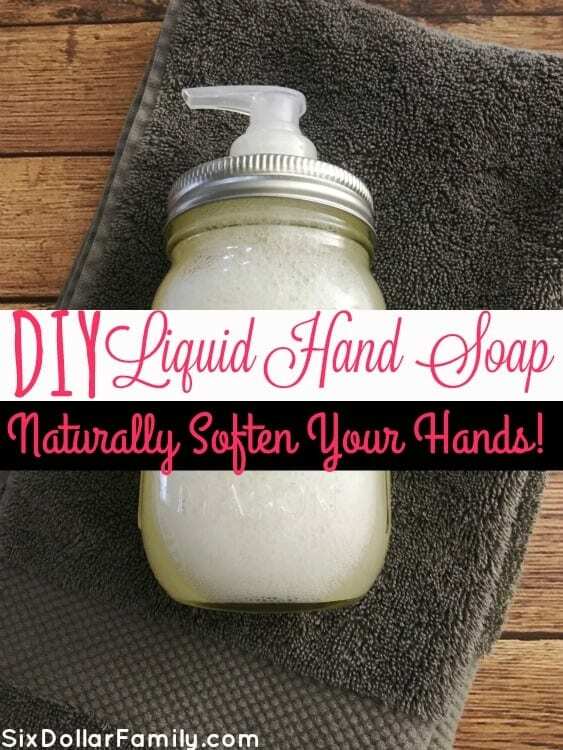 That’s where this DIY Liquid Hand Soap comes into play. I’m very picky about my hands. It comes from years of working in factories when I was younger, but I always feel like they’re so rough. They’re calloused and it has been hard to find anything that truly works at getting them soft. 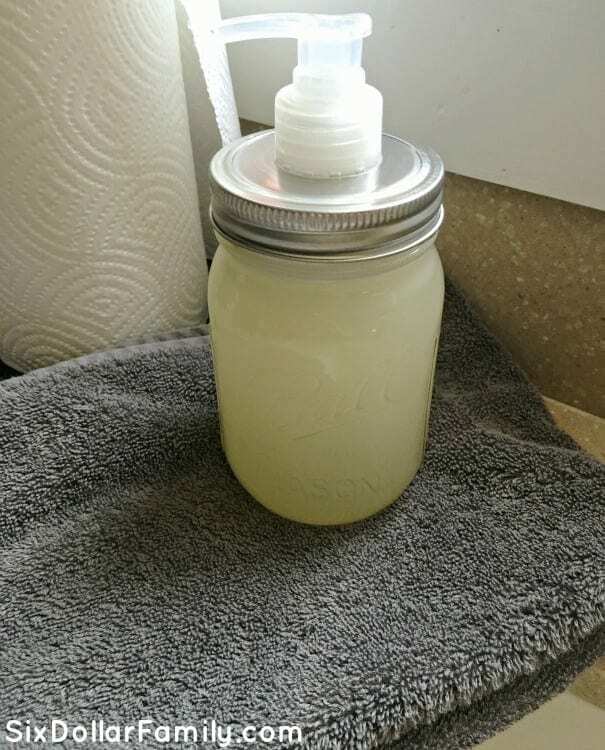 That is until I first made this hand soap recipe. While they certainly aren’t as soft as a baby’s bottom, they’re certainly a lot…and I do mean a lot softener than they were when I first started making it. I know what you’re thinking. Castile soap is expensive. True, it can be, but if you look around for deals, you can usually find it for a pretty decent price. 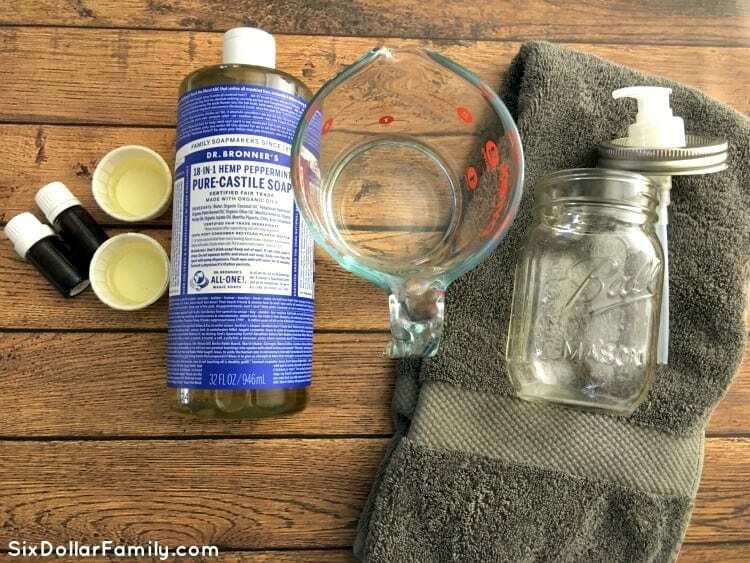 For our family, the cost of the Castile soap was greatly outweighed by the improvement in health and mind that our family experienced when we removed the vast majority of chemicals from our home. Usually, I buy mine on ePantry because they generally have it for a really decent price. I just pick it up when I buy the (few) Mrs. Meyers products that I buy and call it good. (By the way, you can score a free $10 credit to ePantry if you’re a new customer.) 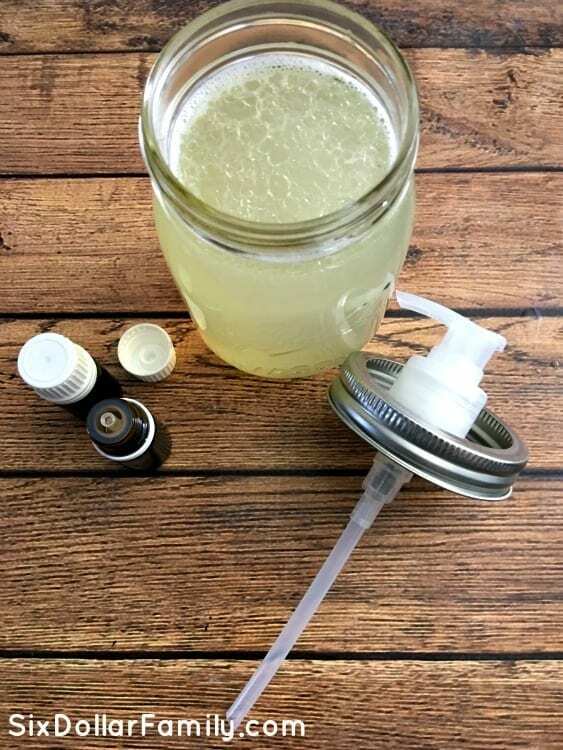 You also have the option of making your own homemade liquid Castile soap too so just keep that in mind when you’re figuring out the cost of making this. The reason that this hand soap softens your hands so well is because of the sweet almond oil and the vitamin E oil. Both are known to nourish skin and to soften it in ways that no chemical agent can do. They don’t just soften your skin on the surface. They actually help give your skin the nutrients that it needs to become soft. Add in the addition of tea tree essential oil and you’ve got a softening hand soap that is also anti-bacterial, anti-fungal and anti-viral. Can’t get all three in a store bought soap, can you? 🙂 If you’re new to essential oils, I personally use either NOW Foods Oils or Plant Therapy oils. Both are pure oils (meaning they aren’t cut with a carrier oil before they get to you) and both are of the same high quality of some of the more expensive essential oils. To start, add the water to the mason jar or container you’re using then the Dr. Bronners. Adding the water first keeps your mixture from creating a lot of suds which can make your mixture turn out wrong. You can use whatever scent you prefer. It won’t make much of a difference. I generally go with unscented or peppermint though because of the oils. Next, add the sweet almond oil, the vitamin E oil and both essential oils. Place the soap dispenser top on your jar and shake well. If after making your homemade liquid hand soap, you find that your soap is too thin, you can thicken it by making a salt water solution. 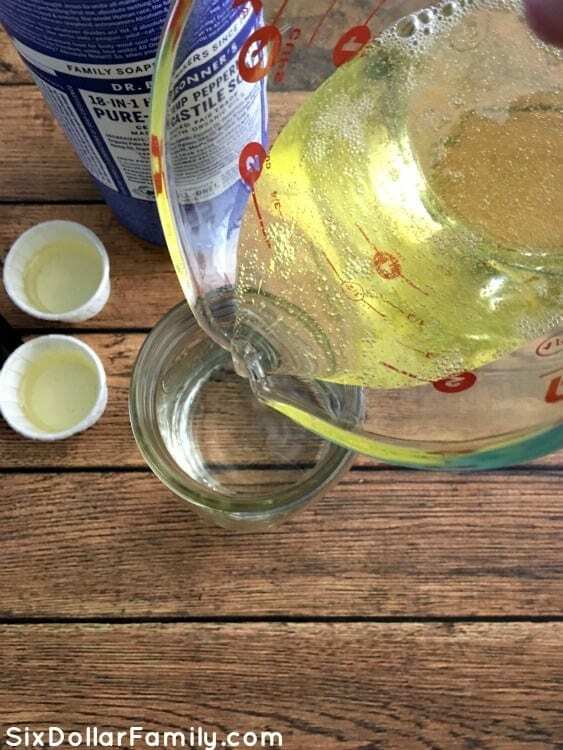 Add .5 oz regular table salt to 1.5oz warm distilled water and stir until it is dissolved. Then, in very small amounts (1 ml or less), add to your soap and stir. Continue adding the salt water solution to your soap until you’ve got the consistency that you want. Store your homemade hand soap on the counter just as you would any other hand soap. Use like you would any other hand soap and enjoy your newly softened hands! This recipe makes 16 oz so if you’re wanting to make it in a batch, you’ll need to double, triple or quadruple it. I generally don’t make too much up ahead of time because the essential oils can lose their potency if exposed to light. If however, you’re using a dark recycled soap container, it should be fine. You could use these amber or blue dispenser bottles as well if you wanted to make a large batch. The colored glass will keep the essential oils “fresh” for longer. I am a DIY and essential oil beginner, and have been reading up on all the information I can get my hands on. I understand that products with essential oils need to be kept in glass containers rather than plastic. I also thought, however, that products containing essential oils need to be kept in dark containers such as amber and cobalt blue (like the bottles that essential oils come in); is this correct? According to the pictures you posted, you use clear glass. Could you please clear this up for me? THANKS! Good evening Tiffany. Could you let me know if the hand wash suds or makes bubbles? Yes, this recipe is sudsy. Not enough for a bubble bath, but about normal. You can use a salt mixture to thicken it but with most homemade soap items, you’ll usually have to shake before use.